After losing quite a few pizzas during transfer to the oven (and of course setting off the smoke alarm each time), my resistance to buying equipment caved and I purchased an American Metalcraft aluminum pizza peel. The first time I used it, it was brilliant. With just some whole wheat flour spread on top, I was able to stretch out the dough and slide it into a cast iron skillet with no issue at all. However, the critical info I’m leaving out about ease of this pizza placement is that the dough was untopped. I topped the pizza in the skillet before putting it under the broiler. One week later, I tried topping a pizza on the peel only to have it stick to the peel so badly that there was no way to get it unstuck, and the pizza had to go into the trash instead of the oven. I remembered reading about that cornmeal works great for keep the dough from stick to the peel, but after reading many opinions about how dramatically the cornmeal affects the crust (for better or worse), I started to have doubts about using it. I concluded that the only way to settle things is to try all of my options out. Therefore, I’m going to make four pizzas as close to identical as I can, using whole wheat flour, semolina, cornmeal, and rice flour on the peel to see which prevents sticking best while delivering the best crust. In a second installment of this experiment, I’ll also try tinfoil and parchment paper, which obviously are not really bench flours but certainly will solve my problem. 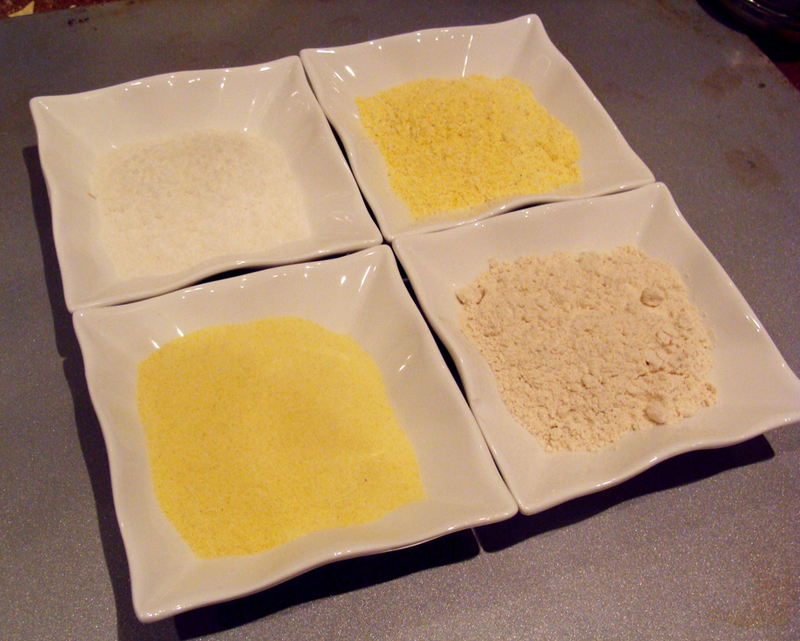 From the top left moving clockwise: rice flour, cornmeal, whole wheat flour, and semolina flour. For each pizza, I first stretched and shaped the dough on a baking sheet coated with whole wheat flour before transferring the dough to the peel which is coated with whichever trial flour I was testing. I then topped the pizza as quickly as I was able, giving the peel periodic shakes to keep the pizza from sticking as best as I could. Moving clockwise from the top left: whole wheat, semolina, cornmeal, and rice flour. So what were the results? It turned out to be pretty uninteresting, really. As you can see in the summary picture, the undersides of all four pizzas were pretty much identical with the exception of the rice flour. The rice flour was not well ground, since I simply made it out of white rice put through a blender, and so instead of helping the pizza slide off of the peel, it simply got lodged in the dough and ended up in the crust (as you can see in the photo). No pizza was covered in crunchy and flavor-dominating cornmeal, or anything else for that matter. Of course, the reason for this is that I don’t use a large amount of bench flour on the peel, and really that should be the goal. You want to be eating crusty-licious dough, not scorched flour (of any type). You may not always end up with a perfectly round pizza as the pizza doesn’t slide perfectly off the peel, but the shape of the pizza is just as likely to be disturbed by keeping the dough moving on the peel while topping. My dough often scrunches up in the middle when I jostle it about on the peel. So what’s my conclusion? I will be using whole wheat flour for three reasons. 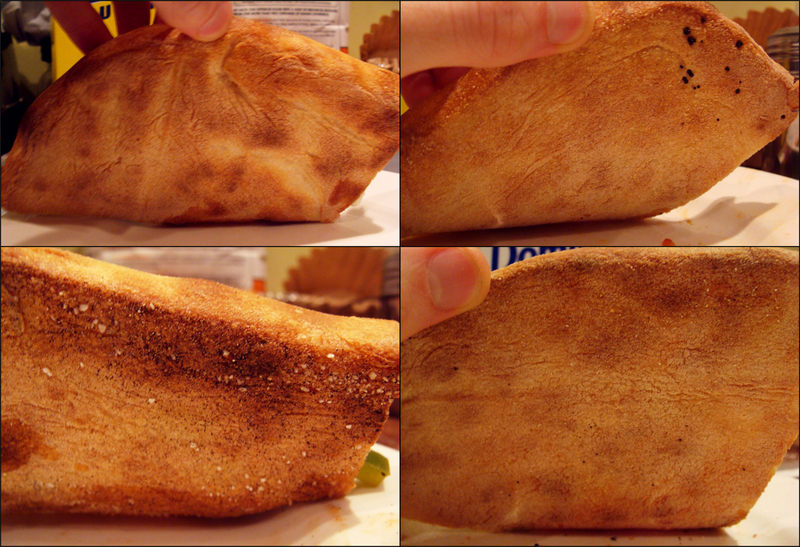 The first reason is it doesn’t risk adulterating the crust. The second reason is that since the semolina and cornmeal didn’t make a significant improvement in dough mobility, I’m more interested in putting these flours to use making pasta, polenta, and corn bread. The final reason is that I will already be keeping whole wheat flour around for bread baking. I can’t really make a meaningful recommendation for others’ purposes, though. To save this post from being too pointless, I would like to share the totally excellent video about pizza, physics, and geometry from the NYU physics department’s very own Colm Kelleher. This entry was posted in experiment, learning, pizza and tagged cornmeal, dough, physics, rice flour, semolina, whole wheat on March 20, 2013 by Dylan Bargteil.